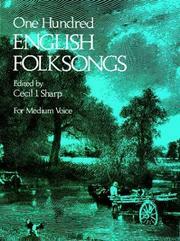 1 edition of One Hundred English Folksongs (For Medium Voice) found in the catalog. Are you sure you want to remove One Hundred English Folksongs (For Medium Voice) from your list? Published June 1, 1975 by Dover Publications .